We've spoken a great deal lately about how certain film genres are tough to nail down. Today's topic is the quirky comedy. A truly example of this genre can be hard to find. Those who don't know what they are doing push the "quirky" angle too far and the movie ends up being blatantly weird for the sake of being weird and this can alienate the viewer. Filmmakers like Jared Hess and Wes Anderson can make it look easy, but others miss the point that the movie should appear relatively normal on the surface and that the quirky must seep out in an organic way. New Zealander Taika Waititi is making a name for himself in this world with his latest effort Hunt for the Wilderpeople. Bella (Rima Te Wiata) and Hec (Sam Neill) live far in the mountains, adjacent to the New Zealand. While, Hec is the strong, silent type, Bella is nurturing and altruistic. That's why she's agreed to take in Ricky Baker (Julian Dennison), a foster child who has a history of mildly objectionable behavior. Paula (Rachel House), the child welfare worker, feels that Ricky is a real danger, and she's glad that Bella has agreed to take the boy. As for Ricky, he sees himself as an urban gangster and he has no interest in being in the country. However, Ricky soon comes to love Bella and Hec. However, when tragedy strikes, Ricky escapes into the bush on his own. Thus begins an epic adventure which will involve survival training, hooligans, and a national manhunt. Reading over that synopsis, Hunt for the Wilderpeople sounds like it would be a drama, and a depressing one at that. And there are certainly dramatic elements here, as Ricky must deal with dramatic change, face survival challenges, and do a lot of growing up. He finds himself surrounded by unsupportive characters, and the basic skeleton of the story could easily fall into the same category as many other movies about orphans who are trying to find their way. However, working from a novel by Barry Crump, Writer/Director Waititi has done a good job of nailing down the quirky comedy formula. The basic elements of the movie may scream drama, but the whole thing has been coated with a sheen of pure goofiness which places the movie in a completely different genre. For starters, we have Ricky. This pudgy kid arrives on the farm decked out like he's about to star in a rap video. He's not the bad seed which Paula described (which is part of the joke), but more of a sad, lonely boy who is searching for an identity. He wants to be a "gangster", but he really doesn't know what that means. He's been placed with an equally goofy, doting woman and a man who barely speaks above a growl. Again, this could have easily remained a drama. But, as the film progresses, the story gets stranger and stranger, becoming more and more far-fetched. But, that's OK, as it's all played straight on the surface, so it feels perfectly normal and plausible. The comedy seeps in through Ricky's unique reaction to the world around him and the encounters he has with others. Waititi does a good job of keeping the movie from going over the top, which is very important here, but he does allow Rhys Darby to run with this odd cameo appearance, which does bring some manic energy to the film. The thing which really makes people work is that Waititi brings a lot of heart to the screen. We actually care about these characters, so we forgive the movie for being a bit bonkers at times. And this is no mean feat, as, at first glance, I had expected to dislike Ricky, and this was clearly the film's intention. When introduced, he is a punk. However, we soon learn that this is a facade, and as Ricky comes out of his shell, and is shown to be very fallible, we come to like him. Young Julian Dennison does a great job with this, and he delivers one of those child performances where he's either a gifted actor or he's simply playing himself. It's always great to see Sam Neill working and, in a similar vein, he brings the one-dimensional Hec to life, and we see a bit of humor in his eyes, underneath all of the gruffness. With What We Do in the Shadows, Waititi definitely showed that he has comedic chops, but that film felt unfocused. He's tightened things up with Hunt for the Wilderpeople and delivered a movie which would be a good companion piece to Napoleon Dynamite and Rushmore. 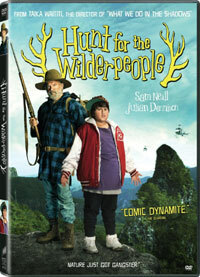 Hunt for the Wilderpeople loves hot water bottles on DVD courtesy of Sony Pictures Home Entertainment. The film has been letterboxed at 2.35:1 and the transfer is enhanced for 16 x 9 TVs. The image is sharp and clear, showing no notable grain and no defects from the source materials. The colors look very good here, most notably reds and greens, and the image is never overly dark or bright. The level of detail is fine (although I would have preferred to have seen this on Blu-ray Disc) and the depth works well, most notably in the exterior scenes. The DVD carries a Dolby Digital 5.1 audio track which provides clear dialogue and sound effects. The scenes in the forest deliver some nice stereo and surround effects, as they highlight sounds coming from off-screen. The finale brings us an impressive amount of subwoofer action as well. The Hunt for the Wilderpeople DVD contains a few extra features. We begin with an AUDIO COMMENTARY from Director Taika Waititi and actors Sam Neill and Julian Dennison. "Behind the Scenes: Hunt for the Wilderpeople" (3 minutes) is a short featurette which packs in a lot of on-set footage and comments from the cast and crew who talk some about the story, but mostly about working with one another. Lastly, we have a 2-minute BLOOPER REEL.